This is a really basic how to on checking your cooling fan. 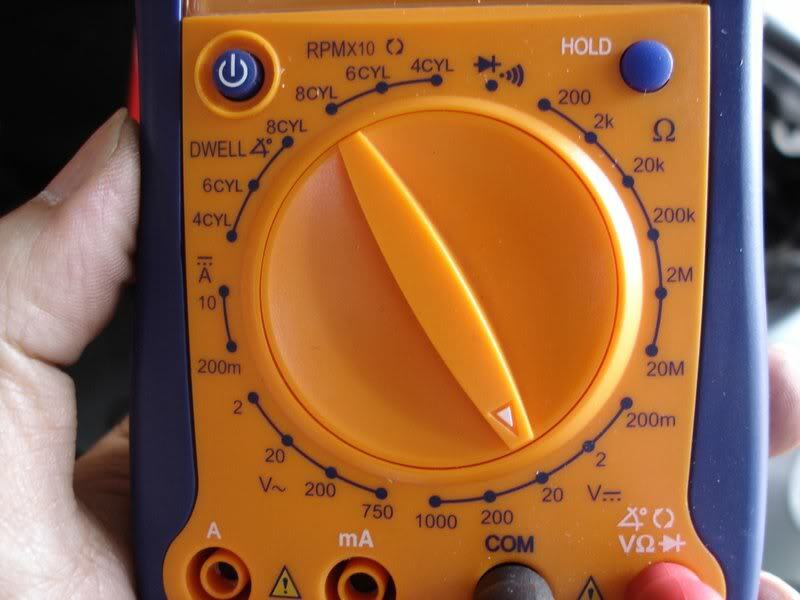 You'll see how to check for the proper voltage and if it runs. I'm not going to cover removing the fairings and or covers. I say that the meter is optional because once you bypass the Thermo-Switch, and the fan turns on, it's really not that important to know what the voltage reading is. 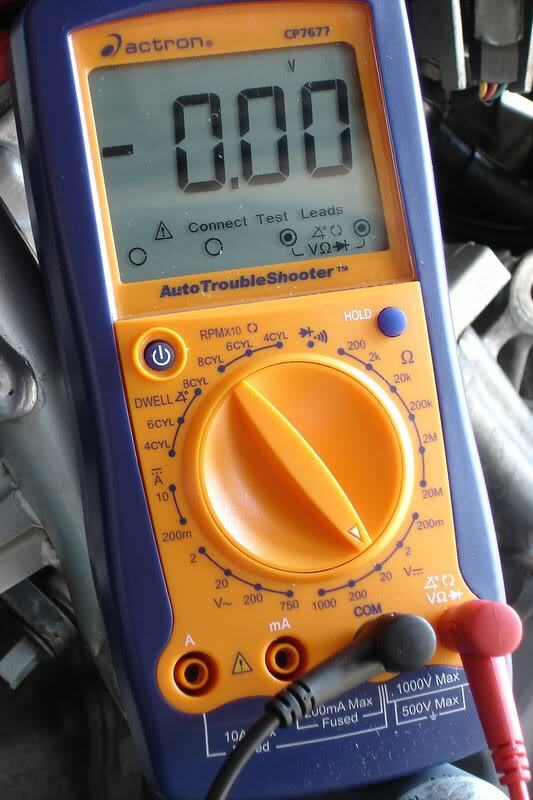 First thing you need to do is set the meter up for checking voltage. The meter I'm using is an Actron CP7677. It's an inexpensive meter you can pick up for less than $50. I like it because not only does it have the basic functions of Voltage, Amps and Ohms, but it has the ability to display RPM's. It can display RPM's in 10 RPM increments which is needed for performing the Idle Drop Procedure on the carburetors. Anyway, you set the meter for DC Volts and select a scale large enough to cover the highest possible reading you might see, which in our case is between 12 and 15 volts. Setting the dial on the 20v scale will do nicely. The RED positive (+) lead goes into the Volt/Ohm port, and the BLACK negative (-) lead goes into the common port. Now, connecting it to the bike. Connect the black lead to anyplace on the bike where there is bare unpainted metal. The bike uses the frame as ground, so it's the same as putting the black lead on the negative terminal of the battery. There is a GREEN ground wire that is attached to the radiator housing. This makes an easy place to attach the ground lead to. For the red positive lead, you disconnect the the single BLACK wire from the Thermo-Switch and insert your lead into that. Initially you're not going to read anything (except for some residual voltage) when the Ignition switch is turned off. When you turn the Ignition switch to the on position, you should generally read 12v. (I had just been starting my bike several times during some carburetor adjustments, so it's a little on the low side). The next thing you can do is take the RED meter lead out of the connector, insert a small flat bladed screwdriver into that connector, and ground the shaft of the screwdriver to the bare metal of the Thermo-Switch. This will bypass the switch and turn the fan on. The Ingntion Switch is providing power to the Fan. The 10A Fuse is good for the Fan. We know what voltage is being supplied to the fan. I've included a video that shows how it's done and what you'll see. If you have any questions or comments, feel free to post them. where can i get that METER from? Boy I'm glad I found this thread. I would have looked for a relay for my non-working fan for ages. Tried "jumping" the fan by grounding it out, and it wouldn't turn on. I also got absolutely no voltage out of it. Guess its time for a new fan/motor. How hard are these to get out? Looks a little tiring but some swivels should do nicely. And yes I know this thread is ancient. ... I also got absolutely no voltage out of it. If you didn't get any voltage out of it, there are a couple of things it could be. First and foremost, check the fuse. There is a 10A fuse that is for the Cooling Fan only. Also, check to see if you have 12v on the Black/Blue wire going to the fan. You'd make this check with the ignition switch turned on. If you don't have that at all times when the ignition switch is turned on, then you've got a problem with wiring or fuse. If you do see 12v, then the fan is most likely bad. Last edited by IDoDirt; 08-20-2011 at 11:29 AM. Hey dirt, quick question. Just check that my fan does turn on, and that it's reading approx. 12v. My question is, in what way does the bike tell when to turn the fan on? I am under the assumption that the fan turns on when the bike reaches something like 210 - 220 degrees, but what is tell the fan when the bike is that hot. The reason i ask is that my temp gauge doesn't work. Does that mean that my fan will never realize if the bike is too hot and therefore not turn on? The fan is switched on from a thermosister on the radiator by the fan mount. (excellent publication, by the way) post.